If you are thinking about buying a Smartphone at this time (October 2018) Under rs 10000 (10K), then you probably confuse which smartphone to buy. At this moment many attractive smartphones are launched in the Indian market. Some of them are looking premium and some of them cames with excellent features in this price segment under Rs 10K (10000). 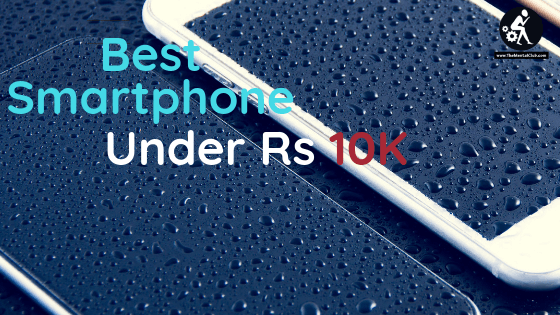 We have brought you a list of the Best Android Smartphone Under Rs 10000 (10K) that you can buy. Redmi 6 one of the Best Android Smartphone Under Rs 10000 (10K) in India 2018. Xiaomi launched Redmi 6 In India in last month. This smartphone is an upgraded model of the Redmi 6 Pro Series. Its price in India is Rs 7999. Xiaomi Redmi 6 has a 5.45 (13.84 inch) HD+ Display panel and 1440 x 720 pixels resolution. The device based on 2.0 GHz Mediatek Helio P22 Octacore Processor. You can Use Dual 4G VoLTE Connectivity on this Device, and You also get a dedicated Micro SD Card slot. The device has a 12MP + 5MP AI Dual Camera sensor on the rear and a 5-megapixel camera sensor for Selfie and Video Calling. The device has a 3,000mAh Lithium-polymer battery for power backup. This handset works on Android 8.1 Oreo-based MIUI 9.6 Operating System. Also, you get Fingerprint Sensor in this device. You can buy this smartphone from Xiaomi’s official website or from Flipkart. Huawei’s sub-brand Honor has launched the Honor 7C in India. The price of the smartphone in the Indian market is Rs 9999 (3 GB + 32 GB). It has a 5.99-inch LED display panel with 720 x 1440 pixels resolution. The device has 3GB RAM, 32GB internal with dual 4g VoLTE support and battery capacity is 3000mAh. This handset works on Android 8.0 Oreo operating system. The device based on 1.8GHz Qualcomm Snapdragon 450 octa-core processor and this device has a 13MP + 2MP AI Dual Camera sensor on the rear and an 8-megapixel camera sensor for Selfie and Video Calling. Also, you get Fingerprint Sensor in this device. It is an upgraded model of the Redmi Y1 and Its price in India is Rs 9999. Redmi Y2 has a 5.99 large display and 1440×720 resolution. The device based on Qualcomm Snapdragon 625 Octa Core Processor. On this device, Two 4G networks cannot be used at the same time, One will Support 4G, and Other one 3G or 2G. The device has a 12MP + 5MP AI Dual rear Camera sensor and a 16-megapixel AI camera sensor on the front. The device has a 3,080mAh Lithium-polymer battery for power backup. This handset works on Android 8.0 Oreo-based MIUI 9.5 Operating System. Also, you get Fingerprint Sensor in this device. You can buy this smartphone from Xiaomi’s official website or from Amazon. Realme 2 is one of the Best Android Smartphone on this price segment price of this phone Rs 8999. This is an upgraded version of realme 1, it has 6.2-inch big HD+ Notch Full-Screen Display and it comes with 13MP + 2MP dual rear camera and 8 MP Front Camera. The device has a 4230 mAh big battery, This handset works on Android Oreo 8.0 Operating System. The device based on Qualcomm Snapdragon 450 1.8 GHz Octa-Core Processor. Realme 2 Has a Fingerprint sensor and, it also has face unlock feature. This Device has the Triple slot two 4g sim Work at the same time also you get a dedicated micro sd slot up to 256 GB. Red Mi Note 5 Is one of the best Smartphone in this price segment. Price of this smart[phone Rs 9999. It comes with Qualcomm Snapdragon 625 Octa-core Processor. This device has a 2160 x 1080 Pixels IPS Full HD+ 5.99-inch display. Display of this device corning with Gorilla glass and it is 2.5 D carved. It has a hybrid sim slot, and it comes with 3 Gb Ram and 32 GB internal. Fingerprint sensor and face unlock feature also available on this device.